Photograph courtesy the Kevin Hughes (RCTS) collection. 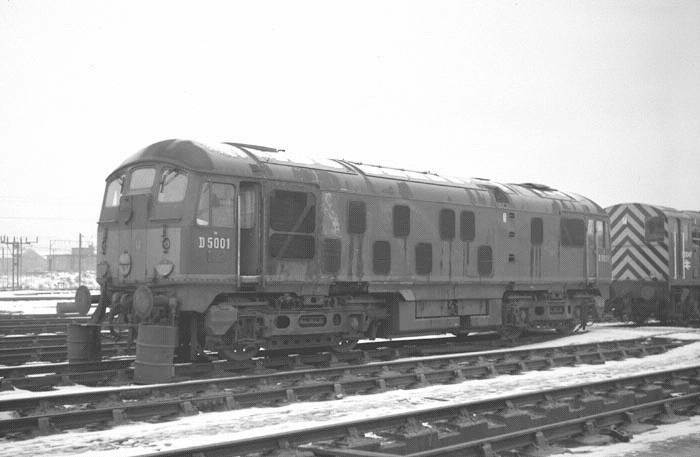 D5001 stands withdrawn at Crewe, February 21st 1969. Although in a very rundown state it is in almost as-delivered condition. It still sports the split radiator screens found on the first seven built, but has gained the yellow front end warning panel and has lost one of the frame level skirt panels. An upturn in traffic on the Eastern Region and a destructive runaway collision at Chester would lead to D5001 and other withdrawn sisters being re-instated later in 1969. The seventeen year career of D5001/24001 saw allocations to London Midland Region, Southern Region, Eastern Region & Scottish Region depots. Split radiator screens (at withdrawal only one of the split screens was fitted). Air filters: five upper and four lower on non-BIS side, four upper & four lower on BIS side. November 1st 1958 to Derby (17A) on loan. February 4th 1959 to Hither Green (73C) on loan. June 1962 to Willesden (1A). June 1962 to Hither Green (73C) on loan. July 1962 to Willesden (1A). February 1963 to Willesden (1A). August 1963 to Crewe South (5A). September 1963 to Willesden (1A). February 1965 to Willesden (1A). September 1965 to Rugby (1F). March 1966 to Bescot (2F). September 1966 to London Division (D01). October 1969 reinstated to Holbeck (55A). July 7th 1975 to store. 24001 was stored at Carlisle from July 1975 to October 26th 1977 when it was forwarded to Doncaster, and being scrapped by the last week of November 1977. Noted Eastleigh Works November 1960. Noted Derby Works October & November 1962. Noted Derby Works March 1965. Noted Derby Works September - November 1969. 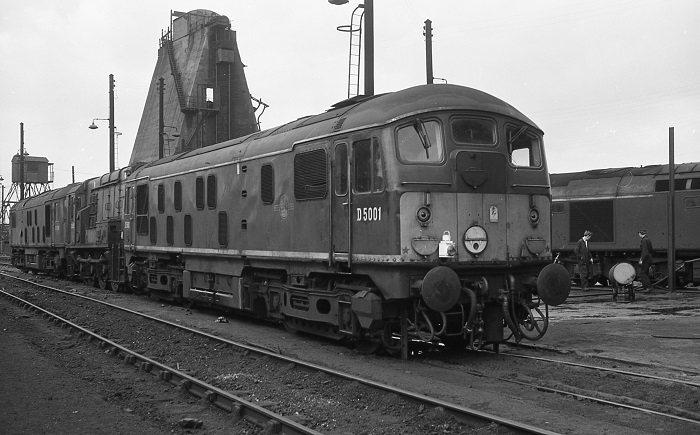 The frames for D5001 were laid down at Derby Works in the summer of 1958, part of an order of twenty locomotives which was itself a component of the original 'Modernisation Plan' inventory totalling 181 (later 184) locomotives. In order to speed the introduction of this class the first ten locomotives were equipped with power units built by Sulzer at Winterthur. When delivered in October D5001 was on paper allocated to Crewe, but then immediately transferred to Derby (17A). Photograph collection of webmaster. The August 1958 Open Day at Derby Works found several new diesels on display in their shiny new paint, including D5001 & D5700. The Metro-Vicks would be received at Derby from Bowesfield for their acceptance testing. 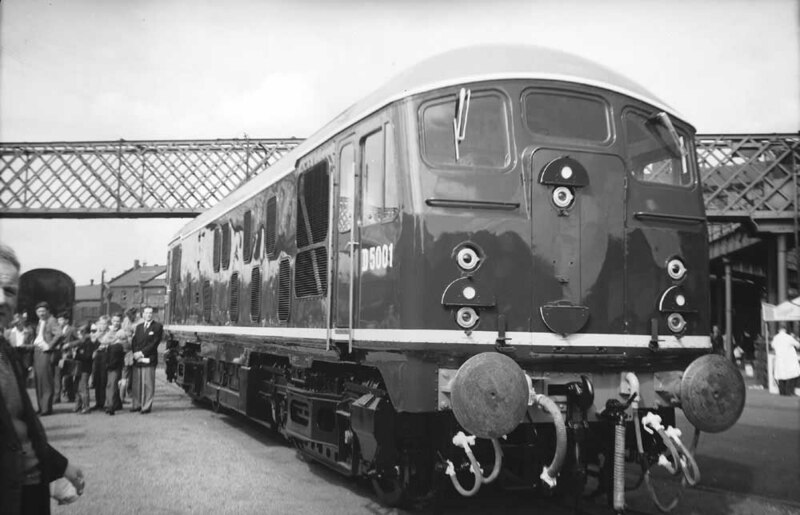 D5001 would not officially enter service until late in October 1958. The New Year brought a request from the Southern Region to borrow locomotives for a short period pending the arrival of the BRCW Type 3s and the completion of the North Kent electrification scheme. The LMR obliged by sending fifteen new Class 24s to Hither Green (73C). Upon arrival on the Southern Region D5000 & D5001 were used for crew training in the Ashford - Ramsgate - Dover - Faversham area. 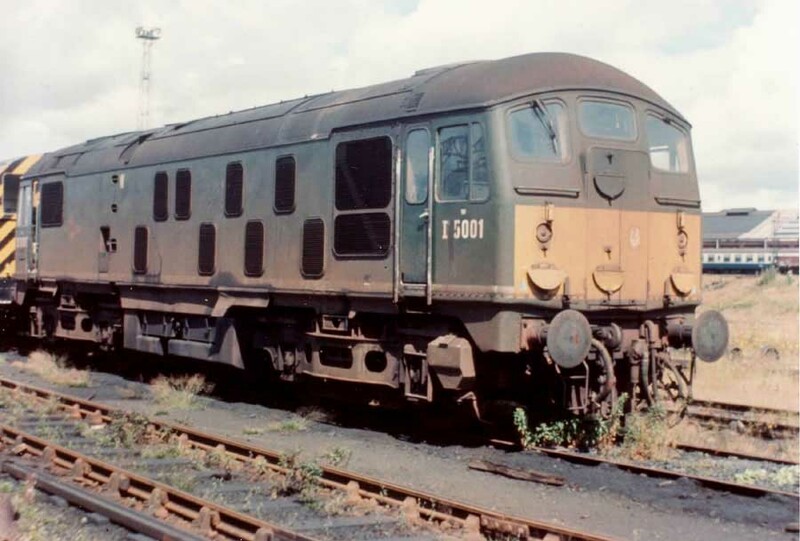 It was well known that these early machines were considerably overweight, to alleviate this D5002 - D5006 had their steam heating boilers removed, giving these five machines a slightly better route availability. Condition June: green livery with frame level stripe, gangway doors present, no headboard brackets, full size fuel & water tanks, no blanking plates, hand/footholds present, cantrail water filler cover present, ridge sided sandboxes, two-rung bogie mounted footsteps, five upper & four lower ventilators on non-BIS side, split radiator screens fitted (both sides), all valencing fitted, engine exhaust in original position. On July 3rd D5001 & D5009 were noted on an educational excursion routed via the East Putney line bound for the SE Division - they could also be found working excursions to the Portsmouth & Southampton areas. The summer season Margate - Birkenhead had been in the hands of the Type 2s from June 15th, working as far as Redhill, noted on the first four days were D5001/02/05/04. On the heavier Saturday working double heading was frequent. 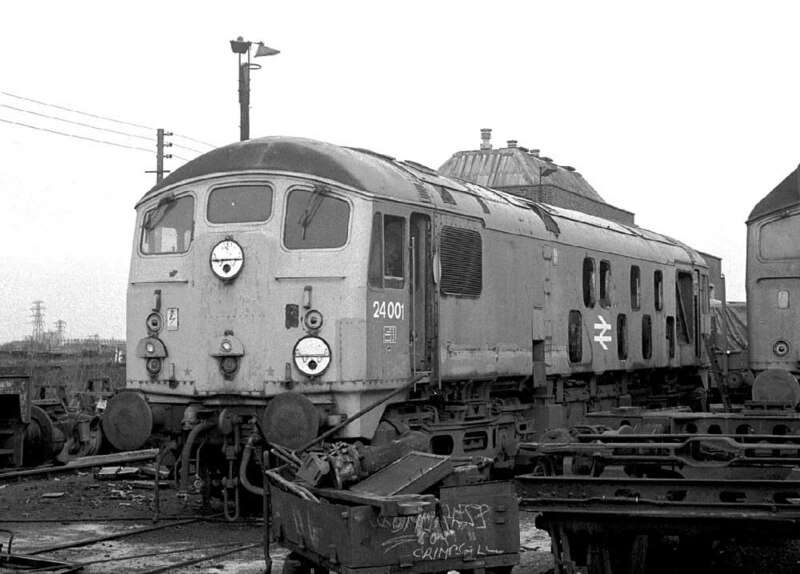 Because of their presence on the Southern Region the Class 24s were now frequently visiting Eastleigh Works for repairs, D5001 was present in November. The Southern Region was now over its temporary shortage of power, the Kent Coast scheme was up and running and the Type 3s were now being recieved from BRCW's Smethwick plant. Hence the loaned LMR Type 2s started to migrate back to depots north of the Thames, with D5001 going to Willesden (1A) during July. A visit was made to Derby Works in October and November for repairs, whilst here it was transferred to Watford (1C). Photograph collection of webmaster. D5001 at Willesden on August 18th 1963. Condition no month: green livery with small yellow warning panels, curved upper corners, bottom of warning panel does not completely cover the frame level stripe, gangway doors present, headboard brackets fitted (both cabs), full size fuel & water tanks, no blanking plates, hand/footholds present, cantrail water filler cover present, ridge sided sandboxes, two-rung bogie mounted footsteps, five upper & four lower ventilators on non-BIS side, split radiator screens fitted (both sides), all valencing fitted. D5001 returned to Willesden (1A) in February, then north to Crewe (5A) during August, then back to Willesden (1A) in September, the last two moves made with D5000. A brief visit was made to Derby Works in November. Early summer for D5001 (May - July) was spent at Derby Works, it seems many of the first twenty Class 24s made frequent visits to the repair shops. In January D5001, along with D5000/04/09/20/21/23 moved to Camden (1B), and then with D5000/04 it was back to Willesden (1A) in February. A brief time in March was spent at Derby Works. By September D5001 was allocated to Rugby. Derby Works was once again visited by D5001 during March & April, it was during March that a transfer was made to Bescot (2F). The completion of the electrification out of Euston, with the local services in the hands of the AM10's and the continuing arrival of the later Derby & Beyer Peacock built non-boilered, dual braked Class 25's to work the local parcels & freight workings found the Class 24's virtually redundant. However in the North West steam was still very active, so late in 1966 a mass exodus commenced with many Class 24s headed north to the Stoke Division (D05), although it is with Crewe that they would be long remembered. D5001 made the move north in April in conjuction with D5000 - D5010 & D5057 - D5060. The original order of 5000 - 5019 lacked certain refinements/improvements added to the later members of the Class. Thus when a surplus of Type 2s occurred as a result of shrinking freight traffic, service cutbacks and line closures, the original twenty were prime candidates for taking out of service. Thus in January 5000/01/05/10/19 and 5090 (accident damaged) were withdrawn, 5001 being at Crewe South when withdrawn. As the year progressed others of this batch went in to storage at various locations. However an upturn in traffic on the Eastern Region and the loss of five Class 24s in a runaway accident at Chester saw authorities searching for a means to cover these demands. Photograph courtesy Grahame Wareham. A fine sunny view of D5001 in storage at Crewe in the summer of 1969. The locomotive has now acquired the smaller water tank, compare with the early B&W view of D5001 at Camden. Also different is the yellow warning panel, the 1969 view has squared upper corners rather than rounded (suggesting a repaint at Derby Works). Condition (summer): green livery with small yellow warning panels, square upper corners, warning panel completely covers the frame level stripe, gangway doors present, headboard brackets fitted (both cabs), full size fuel tanks, shortened water tank, no blanking plates, hand/footholds present, ridge sided sandboxes, two-rung bogie mounted footsteps, five upper & four lower ventilators on non-BIS side, split radiator screens fitted (both sides), all valencing fitted, 'D' prefixes present. During the summer, with the exception of 5005, those of the first twenty that had been withdrawn or stored were re-instated. For 5001 this meant a trip to Derby Works, an overhaul being carried out from September - November, whilst in the Works it was transferred with 5000/09/13/19/90, in October, to Leeds Holbeck (55A). On Christmas Eve Nuneaton sidings were host to 5001, 7619/22/45/46/63/64/65, with 5001 having been on parcels duty, the locomotive reported as ex-shops. In October the Eastern Region transferred a number of Type 2s to the Scottish Region, not only the 'recent' ex-LMR machines but also some of the 'long stayers' that had been at Gateshead for many years. The locomotives transferred to Polmadie (66A) were 5000/01/10-19/73/90, 5096-5101, 5112/113. Others also moved north to Eastfield (65A). In March Polmadie shed closed, its entire allocation being re-distributed with 5001, amongst many others, going to Eastfield (65A). The Blackpool Illuminations over the weekend of September 23rd/24th provided a wide variety of specials in to the area. Perhaps those with the most interesting motive power came from Scotland, noted were 5096 & 5001 and 5178 & 5385 on two of the ten specials from north of the border. A snowless Boxing Day 1974 found 24001 working a coal train from Barony Colliery, Auchinleck. After an absence of six years 24001 returned south to the LMR during January, this time Longsight became its new home. Accompanied by 24004/005 its stay here was very brief, returning to Eastfield (with 24004) during February. This would be its last move, for it became one of the many to be stored and withdrawn during the summer. With the WCML electrification complete and its resultant cascading of locomotives creating a surplus in the lower powered category the decision was made to store/withdraw the greater part of the Class 24 fleet. This occurred during the summer of 1975 with 24001 stored in July and withdrawn in early October. 24001 was initially stored at Carlisle Kingmoor. 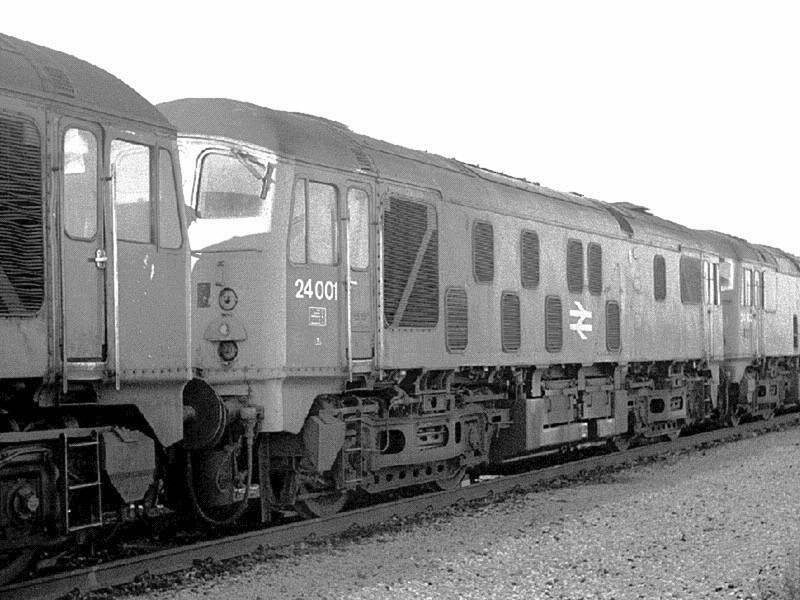 The storage of many Class 24s in the summer of 1975 found long lines forming at Crewe, Kingmoor and at several Scottish locations. Here, (viewed on October 28th 1975), 24001 will remain for almost two years before heading south to Doncaster. It has exchanged its split radiator screen for the more normal solid mesh panel. Carlisle Kingmoor remained the temporary home for 24001 until the call to the scrapper was made on October 26th 1977 when 24001/072 & 24148 moved south as the 9Z14 07.00 Carlisle - Doncaster. This was the first time that a scrap convoy of Class 24s had moved south from Kingmoor, all previous movements had been to take the scrap Class 24s to Glasgow, perhaps they no longer had need of the spares or that Doncaster would retrieve them for re-use. After an existance of nineteen years Doncaster Works quickly reduced 24001 to just so much scrap during November. Photograph courtesy Tony Sayer. Its November 6th 1977 and 24001 awaits the attention of the cutters at Doncaster Works. Within a matter of days 24001 will be no more. Condition final: blue/yellow livery, gangway doors sheeted over, headcode discs centered on cabfront, headboard brackets fitted (both cabs), full size fuel tank, shortened water tank, blanking plates removed (non BIS side), hand/footholds plated over, striaght sided sandboxes, three-rung bogie mounted footsteps, five upper & four lower ventilators on non-BIS side, split radiator screen fitted (non BIS side only). Page updated March 14th 2019.